The ImageRamp family of capture process automation tools help automate your document workflows with ease. Complex tasks are made simple to intuitively secure and accelerate your documents throughout your organization. 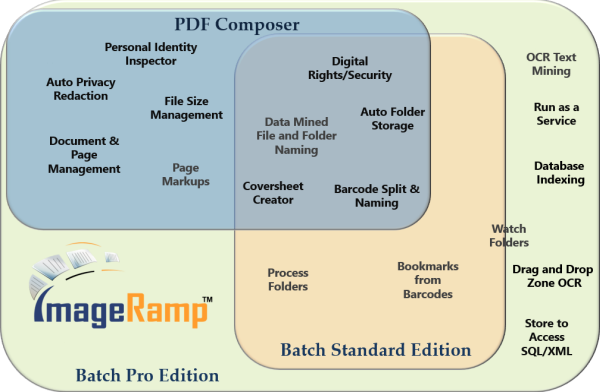 ImageRamp™ Batch is a simple-to-use folder processing tool to automate your file naming and storage, indexing, and document capture into various EMR/EDR, document management or other secure storage environments. Whether you are extracting metadata for file naming, splitting or routing, ImageRamp Batch easily integrates this information into your environment. Use Batch with your existing MFP copiers, scanners, or even preexisting PDF files by assigning Profiles or tasks to specific folders for unattended document processing. With ImageRamp, work in a network or cloud environment. 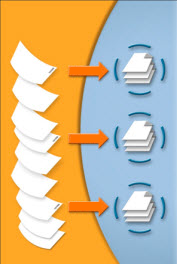 Process a folder of documents on demand or set them to be "watched" for automatic processing. ImageRamp Batch delivers stress-free document processing automation. Scroll down for more information on ImageRamp Batch. ImageRamp PDF Composer provides a simple, intuitive tool for everyday document needs. Easily import PDF, Image, and Word documents into an easy-to-use environment to securely annotate, redact, encrypt and arrange your documents. Composer's Privacy Inspector detects potential document content that may require privacy data redaction. 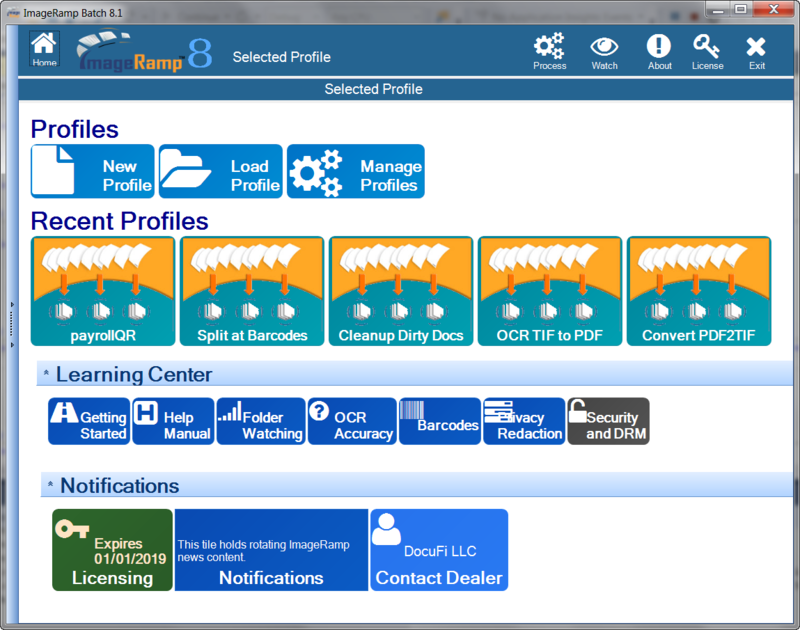 Manipulation based on barcodes adds additional automation of document tasks with the Pro edition. Use Composer’s unique file size management to save space by limiting file sizes to your specification. Seamlessly integrate with desktop scanning applications like Fujitsu ScanSnap Manager. Implement in network and cloud environments. 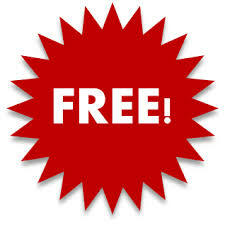 Includes free image comparison tool. See ImageRamp PDF Composer for details or scroll down for info on ImageRamp Batch. New to batch document processing? Learn more with our tutorial What is Batch Document Processing? Batch users can process a folder of documents on demand or folders can be "watched" so that any file placed in the watched folder is automatically processed. Run Batch as a Windows service with email notifications on automated restarts, excessive memory or CPU usage, or any unscheduled stops. With Batch, convert file formats, read barcodes for file naming, splitting and routing, secure your files by applying digital rights, or create CSV or XML files for indexing into your EMR or document management environment. Additionally with ImageRamp Batch data mine for text to automate the file naming, splitting and routing in your watched folders for automated document processing. Batch provides additional previewing and testing functions to ensure you correctly name, split, route, and clean your documents. ImageRamp Batch adds intelligence and efficiency to maximize your investment in the scanning process and is available in three versions to meet your budgeting needs. Review the ImageRamp Batch Editions to understand which Batch product best fits your needs. Automate file naming and folder creation. See the SlideShare. Use Regular Expression scripts to automate text extraction or splitting. See the SlideShare. Clean up images to increase accuracy and reduce storage needs See the SlideShare. Batch is simple to install and use in your environment. First, create a document profile where you define specific tasks for all files contained in a specific folder. Name and save this information as a re-usable profile that you can assign to any Windows folder. You now have a batch scan process. Batch includes utilities to test your settings to see where your documents will split and how it is reading barcodes or extracting text. A built-in viewer highlights the extracted barcodes or text expressions and highlights pages that will be new splits with your current settings. Make simple adjustments before processing a directory full of files and you're ready to go. ImageRamp Batch Test Feature identified detected barcode information and file splits according to the selected Profile settings. With the Process Folder option, users select a Profile, designate the Windows folder to process and where the resulting files are to be placed, and begin the document processing. The progress of the processing can be monitored and a viewing window displays files as they are processed. If you would like DocuFi Batch to automatically poll a folder for any new files and automatically process the files contained there, Watched Folders are designated in Batch. This function is based on Microsoft's Windows services. In Microsoft Windows operating systems, a Windows service is a long-running executable that performs specific functions and which is designed not to require user intervention. Windows services can be configured to start when the operating system is booted and run in the background as long as Windows is running, or they can be started and stopped manually when required. In Batch Standard and Pro editions, up to three folders can be watched and automatic polling can be started and stopped. Once started, the service will continue to run as long as the computer is on and it is restarted every time the computer is started. To stop the processing, you must either turn the computer off or manually stop the service using the Stop button in ImageRamp Batch. As noted in the screen above, not only are the Profile and input and output folders designated, a backup folder is named as well. All files in the Folder to Watch directory will be processed and at end of the operation, this directory will be empty and the original source files are moved to the folder designated in the Backup Folder field. As batch processing cannot be undone, the backup directory is a safety feature where the original files can be placed so they can be viewed if there are any questions on the accuracy of the information and processing. Learn more at Watching Folders For Unattended Document Processing. So what document processing can you specify in Batch Profiles? In other words what can you do with the scanned or existing files in a "watched" folder? Barcode recognition, text mining and OCR functions provide ImageRamp Batch with powerful tools to find and extract valuable information from your documents. Batch can search for standard 1D and 2D barcodes to extract information to split, name and route files. Most commonly, barcodes are used to provide index information. 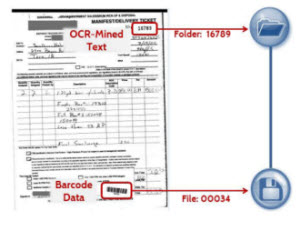 As with barcodes, OCR technology can simplify processing of the scans or files. These technologies minimize data entry and make automated processing possible. Then information can be easily shared with your document management or EMR system. ImageRamp provides sophisticated image cleanup and enhancement features too. Cleaner images mean better OCR accuracy and customer search and retrieval. Read more 20 Tips to Solve Common Problems Reading Barcodes. With ImageRamp capture index data at the document's point of entry into your workflow. ImageRamp provides a flexible environment allowing users to set up various indexing configurations. These customizable job menus or profiles help capture critical document properties for use in any database system through direct (MS-Access, SQL Server, ODBC), CSV, or XML interface options. Advanced users employ regular expression (Regex) scripts to eliminate improper field indexing by defining rules for the index content. 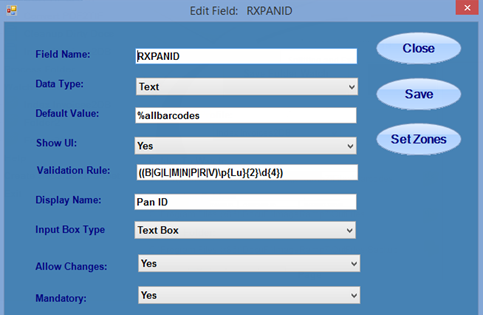 Use barcode data or zonal OCR for automated file naming and populating index fields. Use highly reliable barcodes to automate the file splitting of your documents. 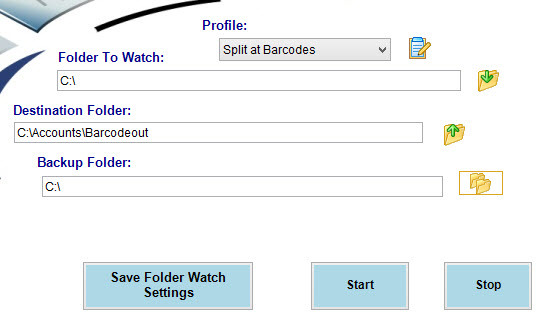 Simply check the Split at Barcodes checkbox and additional options to tell the system to start looking for barcodes. 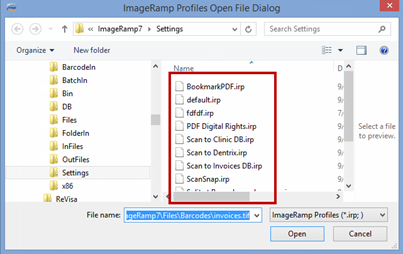 ImageRamp creates new documents whenever appropriate barcodes are encountered. You have the ability to define which barcode types to look for. If your documents don't have barcodes, learn about our free barcode tool. Instead of splitting the file based on the barcodes, you can elect to insert bookmarks and keep the scanned stack as one file. 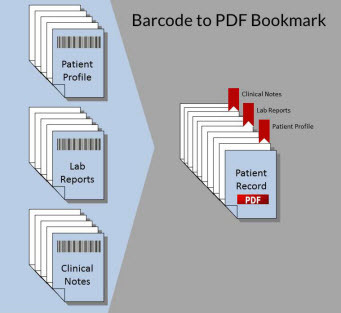 Barcode to PDF bookmark can let you create a single file such as a complete patient record where the user can jump to bookmarks such as clinical notes, prescription orders, lab results, and more. Or, use the barcode data to name and identify routing needs to Windows folders. Files can be automatically placed in a folder that is named using any barcode data, scan date or time, and more. 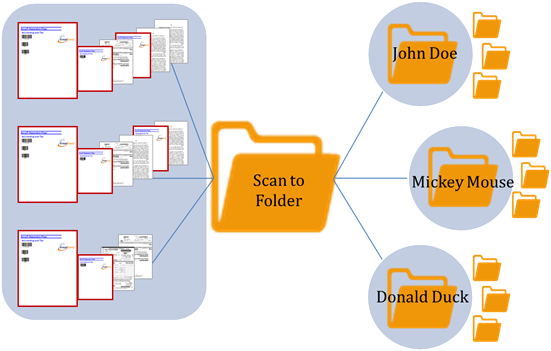 OCR text mining technology can also be used to name and route files. Zonal OCR "reads" text from a specified zone on the document and extracts that text for indexing and file naming. 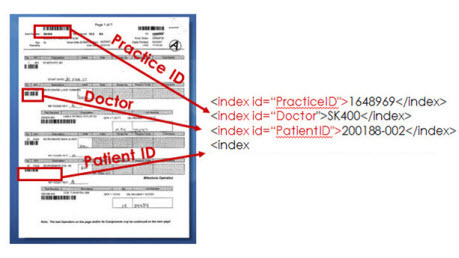 Use Regular Expressions to capture precise OCR data for indexing, naming and splitting too. And did we mention that ImageRamp can enhance and clean up the images? Basic clean and enhancement functions such as deskew, despeckle, auto rotate, remove blank pages and remove lines increase the accuracy and reliability of the information extracted from the scans. Accuracy is further improved with ImageRamp's advanced clean up functions. Adaptive thresholding assists in cleaning "dirty" documents or documents that have a colored background which interferes with the foreground data. Learn more clean-up with Improving OCR Accuracy with Image Cleanup and Enhancement. 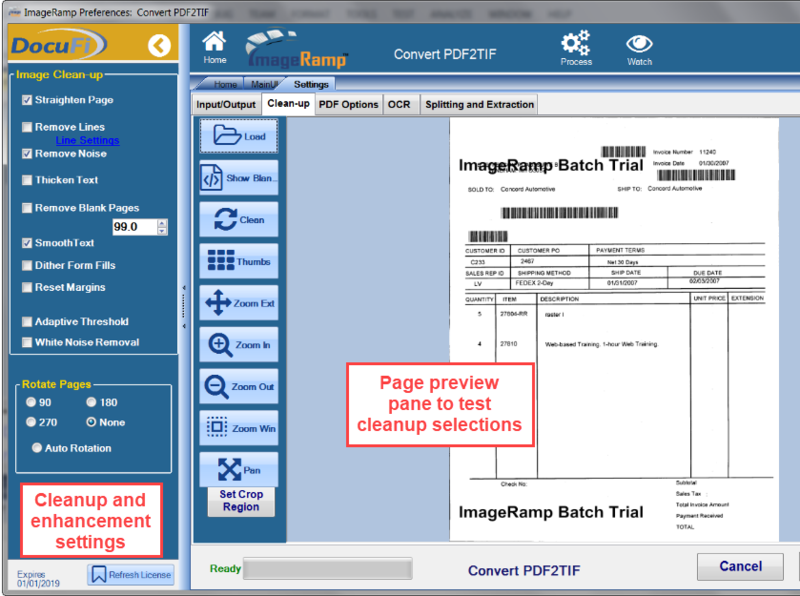 You can easily configure ImageRamp Batch and ImageRamp PDF Composer to work directly with Fujitsu's hugely popular ScanSnap scanners. ImageRamp is configured for use with the Fujitsu ScanSnap Manager, the scanner's main interface, with no additional user actions required. Shortcut buttons let users save their settings and destinations for easy selection right from the touch screen. 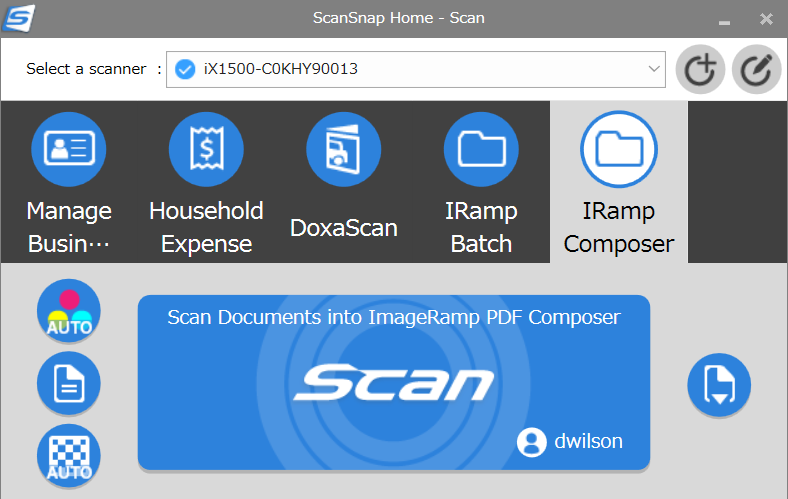 After installation and setup, ImageRamp is now available to use with the ScanSnap Manager. Learn more at Using ImageRamp with ScanSnap Manager. While users have long been able to create barcoded cover or separation sheets for file routing, naming and splitting purposes and Batch includes a free tool for just that, Scan Separator. This function has been improved with ImageRamp Batch and users can now place barcode data that is common to a stack of papers on a "master" cover sheet and then use subsequent cover sheets throughout the stack to provide more information. With this flexible feature you may want to store the location or routing of files in the"master" cover page barcode and use single barcoded pages for splitting and file naming. In the illustration below, the "master" coversheet in each of the stacks contains routing information to direct the files to the appropriate folder and subfolders and the subsequent cover sheets split the stack into files and names them. Our example could route the first stack of tax information to the file system as John Doe/2014/Income and the files could be named rentalhouse1.pdf and rentalhouse2.pdf. 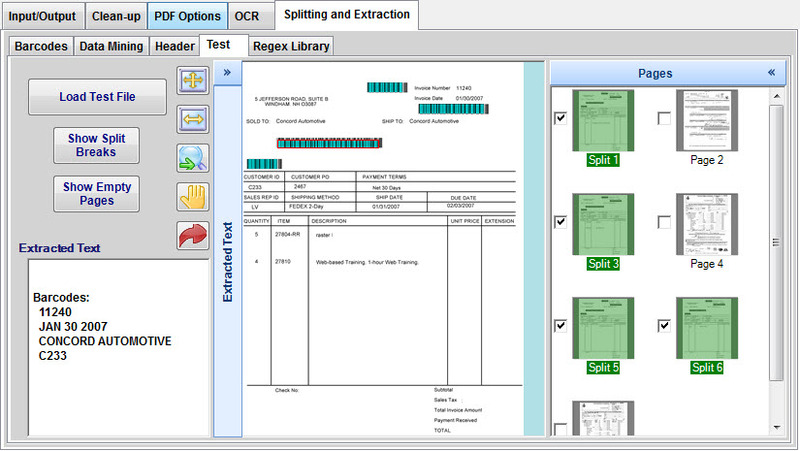 This is set up by selecting the Duplicate the Cover Page checkbox and identifying the expected number of barcodes. 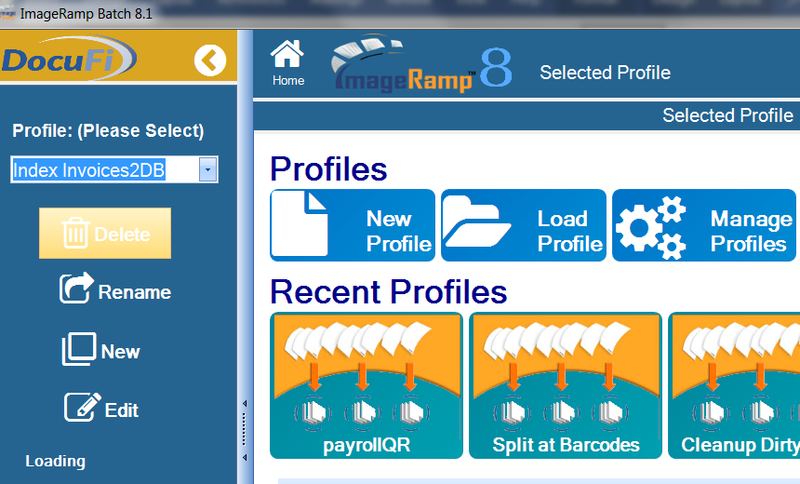 If cover pages lack the expected number of barcodes, ImageRamp creates a Not Filed folder in naming configurations. Our users often have an "ImageRamp Administrator" who defines profiles or workflow processes and controls integration with other document management systems. These administrators select all the options on how a scan should be performed and what should be done with the resulting file and extracted information in a reusable template called a "profile. Preferences for the various document processes you want to perform, can be stored in what we call a Profile. The product comes with a number of default profiles and unlimited workflow operations can be customized. If you require securing or protecting your source documents, you can elect to save them to PDF format and apply Digital Rights Management (DRM). Regardless of the source document format, the files can be saved to PDF and have security measures applied. Composer PDF - Assemble PDF files from PDF, Image OR MSword files and add security or Privacy redaction. Scan Separator - create barcode coversheets with this free tool.